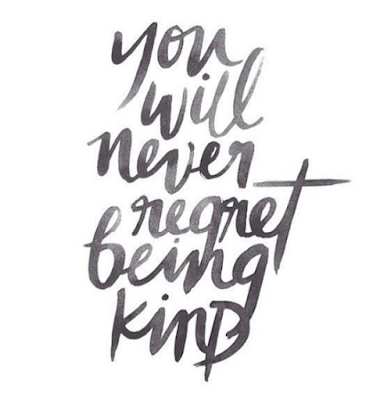 We all have moments in our lives where we have the opportunity to choose kindness. Whether we do so or not is another story. I am a firm believer in taking the high road. I don't believe it is worth it to be unkind. Even when we feel it is justified. To get a point across? You are rude, feel maybe a minute of satisfaction and then are stuck with the repercussions for life. I bet the guilt I'd feel for the way I acted would stay with me longer than my actions would with that person. I worked at a company for several years. During my last year there I was feeling pretty burnt out and run down. They brought in someone new who was supposed to be my partner and make my workload easier but they ended up creating twice the amount of work and got all the credit when I cleaned up their messes. After a year of working with my "partner," I found a better job opportunity and was able to leave. I had several people ask if I was going to tell this person off and let them know how I really felt. I planned to if the opportunity presented itself, and it did. My last day there we were the last two people to leave the building. We walked to our cars together and I remember standing in the parking lot just the two of us. I had a years worth of suppressed feelings I wanted to unload on them. They were on the tip of my tongue. I couldn't get in trouble with the company since I no longer worked there. But I decided to say nothing. Not even a sarcastic remark. I just stuck with goodbye and I honestly don't regret it. The world is such a small place. You never know when those harsh words might come back to bite you. You will regret harsh words that can't be unsaid. You will regret hurting someone's feelings. You will regret leaving a negative impression on someone. I encourage you to always choose kindness. Even when you feel justified. Even when you don't have the patience. I guarantee you will never regret it.